Twelve-year-old Jerri Dawson said she’s used to being bullied. 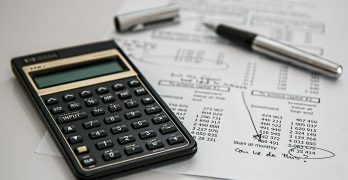 While middle school students are known for being mean to each other, Jerri said the bullying took a turn for the worse during the weeks leading up to winter break. 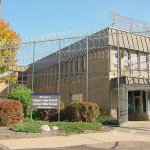 Mean-spirited and negative messages directed at individual students began appearing in the girls’ bathroom at Lloyd Street School, one of four Milwaukee College Prep campuses, at 1228 W. Lloyd St. Jerri said she had never experienced bullying like this, and she wasn’t the only one. “It was kind of a shock to me,” said seventh-grader Eliana Cook, one of the victims of the incident. Before this, Eliana said she had never been bullied before. Teachers scrubbed the graffiti off and monitored the bathroom to determine when the messages appeared. Bama Grice, a sixth-grade teacher, said students reported the messages right away, but it was impossible to determine who wrote them. “I felt that it changed some of our scholars’ demeanors first thing in the morning,” Grice said. Eleven-year-old Amani Berry was disheartened to see the bathroom stalls covered in negative messages. She said MCP is a family, and it isn’t right for students to treat each other that way. Although the culprits were never identified, less than two weeks after the graffiti began, it stopped. 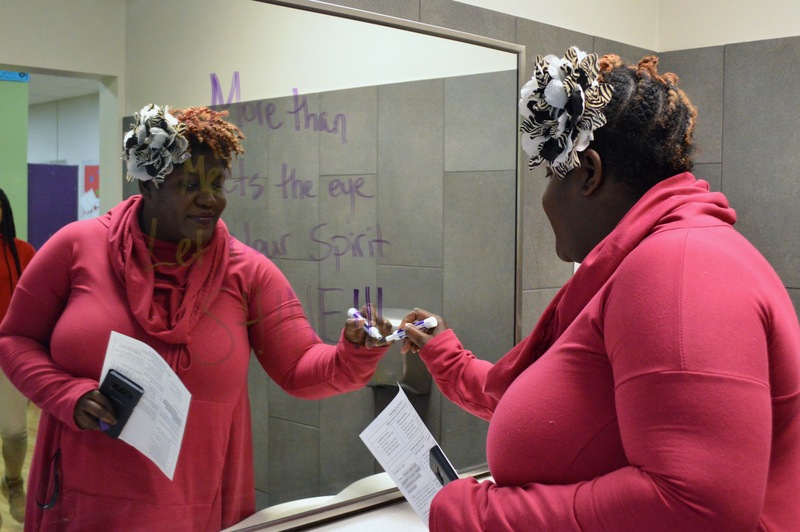 Soon after, inspirational messages began appearing on the bathroom mirror, courtesy of Tiffany Miller, a special education teacher at Lloyd. 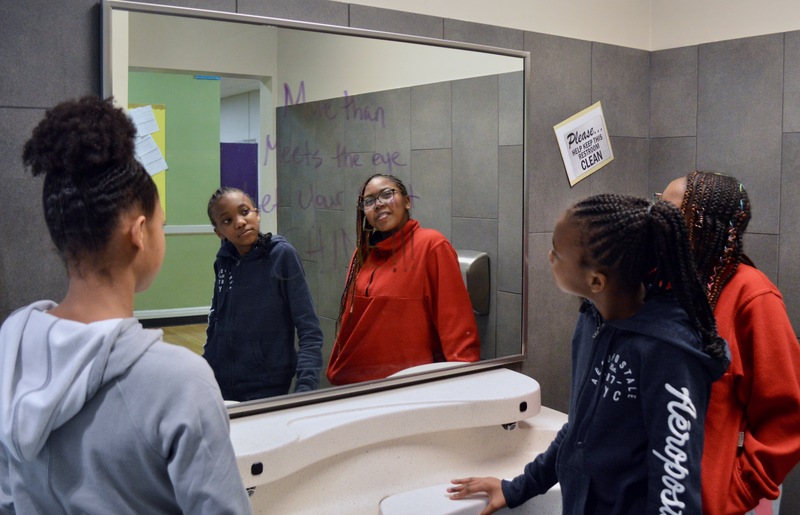 The messages encourage the girls to acknowledge their beauty, embrace their “inner queen” and “ Let your spirit SHINE.” They inspire a good attitude, said sixth-grader Zaniaya Cunningham. Students began requesting to go to the bathroom just so they could see them, added Grice. Miller explained that even though the graffiti had stopped, its negative impact lingered. The graffiti distracted the students, and they struggled to focus on their schoolwork, she said. The idea to write a positive message on the mirror just came to her one day and she hasn’t stopped writing them since. The impact was instant, said Principal Mark Ketterhagen, who’s been in the position for five years. Miller’s messages on the mirror changed students’ perceptions and made them think more critically about their words and actions. Often students don’t think about how their actions will affect others, as evidenced by the initial messages, Ketterhagen said. The graffiti called out specific students and sometimes they would retaliate with a response of their own. When the negative graffiti first appeared, Ketterhagen was dismayed. “It’s always frustrating when our students make choices that make another student feel bad,” he said. Middle School Dean Tim Trzcinko addressed the seventh-grade girls during a “restorative circle,” a process the school uses to address challenges. During the circle, the girls connected with female faculty members and discussed self-love. Teachers also focused on supporting the students whose names appeared on the stalls. In line with MCP’s mission to help develop character, they discussed the bullying during classes and encouraged students to engage in the conversation, Ketterhagen explained. Alisa Flowers, a sixth-grader, said she looks forward to the messages on the mirror every day. “Every time I see the message I need to set a goal for the day,” she said. Sometimes her goal is to focus extra hard on her schoolwork and other times it is to do what her parents ask. Amani said the messages have inspired her to spread positivity. They encourage her to love herself when she’s feeling sad. When a student starts acting up, Grice has her read the message in the bathroom. Students such as Eliana and Jerri have noticed a decrease in the amount of bullying. Miller plans to continue writing messages every day. Her actions have encouraged teachers at other institutions and friends with daughters to do the same, she said. She’s also looking for a way to expand her messages to the boys’ bathroom. “Everybody should see positive messages,” Miller said. Way to go Tiffany. Spread you spirit and bloom further and further. You make a difference. A little kindness and thoughtfulness can make a big difference in someone’s life. Thank you Ms Miller for being a positive force in our Milwaukee schools. That’s our Tiffany always finding a way to bring out the best in everyone. You always inspire me.